Last week I mentioned that American had quietly launched their new Main Cabin Extra product that offers passengers more legroom in coach, and that many of their Boeing 757 and 767-300 operated flights were now displaying seat maps that were updated with these new configurations. 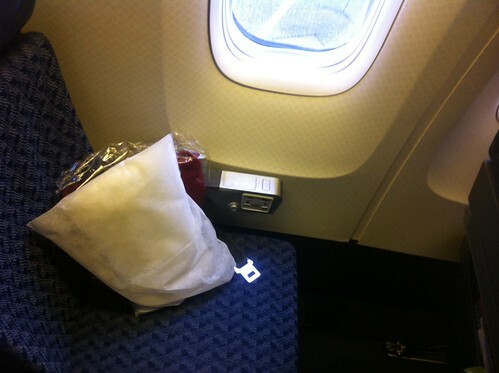 Over the weekend I heard from a reader, David F., who was traveling from London to DFW on an American Airlines 767-300 and happened to have a chance to try out American’s new economy plus product. 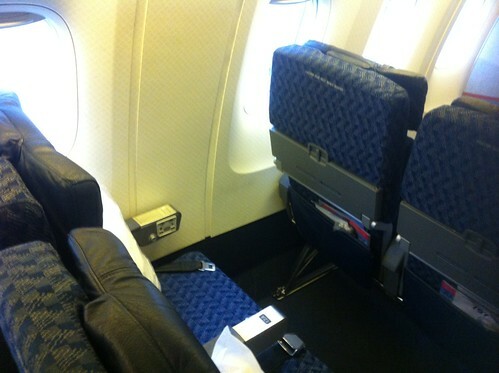 As the aa.com layout shows, this is a mini-cabin between Business and Regular Coach – I don’t feel it was full of Advantage Elites and this was a full flight! The seats did not really start to fill up until main boarding began – the two people in front of me were not regular flyers – and the person sat next to me did not speak English as a first language so it was difficult to ask. Pics pretty much show it all, I would definitely get it if you are on a full flight and it made the long journey much better. I would go for rows 11 or 13 first – 11 if you don’t mind bulkhead – you can stand up in front of your seat – 13 because you can recline without upsetting anyone behind you – although there is a restroom behind 13, I wasn’t disturbed by it. 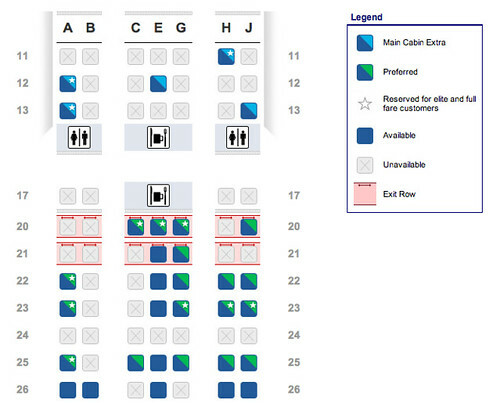 Row 12 isn’t horrible – just would not be my first choice given the opportunity. The Recline is no more than a regular coach seat, in fact I would say if you are the kind of traveller who either doesn’t like to recline for fear of upsetting the person behind you and/or doesn’t like it when someone reclines on you, these are great seats, the person in front reclined all the way and I did not feel encroached upon. It definitely looks roomier than I expected. 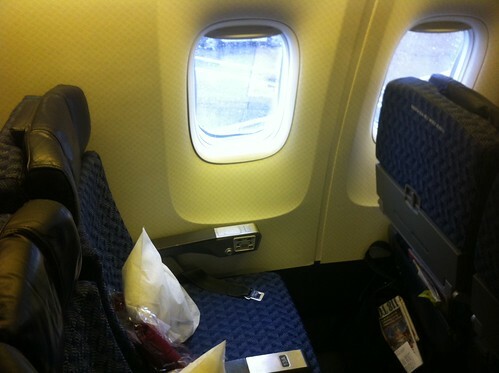 David was able to select a Main Cabin Extra seat because he has AAdvantage Elite status. Without status is would have cost about $118, which on a long flight like London to Dallas seems like a bargain! Rapid Travel Chai is giving away an Admirals Club day pass in a random drawing! Go here to enter. Don’t forget that the Frugal Travel Guy’s Monday Deal of the Day is sponsored by AAdvantage. Share your best AAdvantage or AA related tip for a chance to win 2,500 AAdvantage Miles! 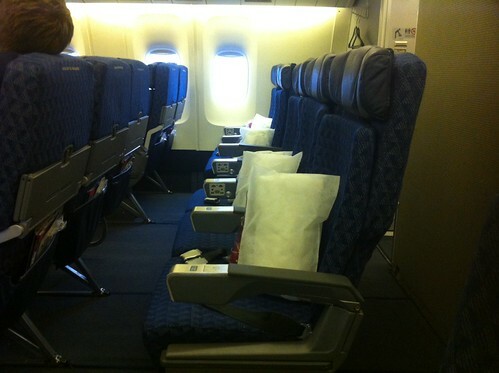 On a recent LHR-DFW flight I had the chance to try Main Cabin Extra on the 767. My Executive Platinum VIP upgrade didn’t clear, so I settled my 6’3 245 lb frame into row 13. I must say I was satisfied with the product. American has a winner as far as I am concerned. Naturally I would prefer to have the upgrade clear (which is difficult on Thursday or Friday LHR-DFW)but at least I didn’t feel beat up after the 10 hr flight. 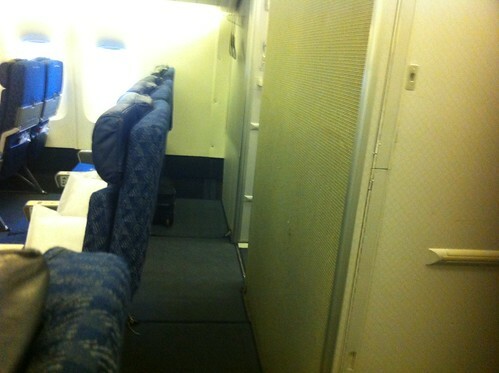 @SteveThurman – Would you happen to know how Main Cabin Extra compares to 21AB or 21HJ? I can’t tell from the photos if it’s the same amount of room, less, or more. 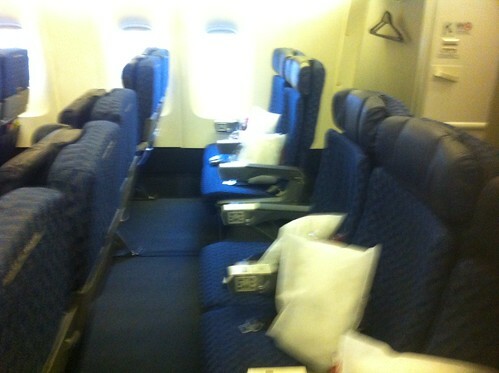 Are the seats wider than regular cabin? @ anil – They are. They’re using 777 seats for MCE, so they’re wider, by about an inch. Exit row seats in the regular cabin have reduced width because of the trays, so they’re more narrow than the rest of the seats in the main cabin. 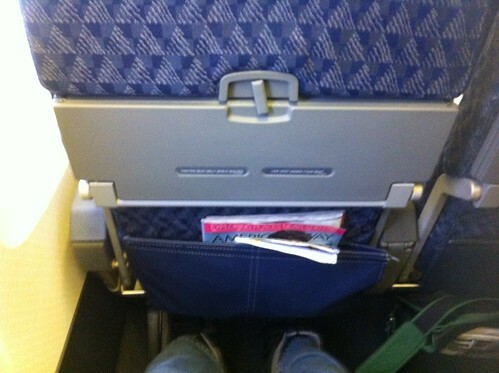 If you compare MCE to the exit row, you’ll notice a big difference. Does anyone know what row is best to sit in on a 757 going on seat guru I was thinking row 15 does anyone have any thoughts? Hi, would you recommend theses seats for a mom traveling with small children? Have MCE seats for RDU to London next week. I had this version on Delta last year and you got complimentary alcohol on the international flights. Does American’s MCE offer this? @ Nick – Beer and wine are complimentary in the main cabin and in MCE on all of their flights to Europe, South America, and Asia. Those seats make a HUGE difference. Unfortunately as of today Aug 19th 2013, they are still not avail on US-Asia flights where they would be the most beneficial. I got to try main cabin extra on my trip to LA a couple months ago. I flew it on the MD-80 and the 737-800 for my connection. The seats are amazing. You get good legroom for an economy plus seat (up to 37″ of legroom on most of its mainline fleet, an extra 6″ from regular coach), as well as priority boarding and if you’re on the 777-300 you also get a wider seat. It’s about time American started doing premium coach and I hope they add mce to the ex us airways planes once the merger is complete. 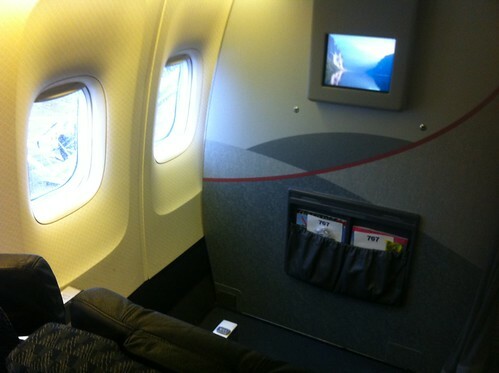 I took a trip in july from Ohare to Rome italy with American on their Boeing 767-300, it happened to be one of their newly repainted livery planes, I sat in the MCE seat 13j and the legroom was amazing their was no one behind me due to the restrooms being behind me, it was quiet and i enjoyed the extra $88 dollars that i spent to upgrade that seat, i was also able to board after business class and club members which was nice so i wouldn’t have to deal with everyone putting a bag in the overhead! 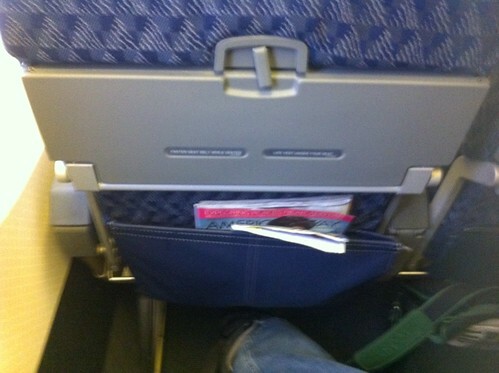 In other words, add it up; AA scrunched the regular coach seats even tighter together. To me it seemes like a punitive thing if you are trying to get away with only paying the base fare. Take home: If you’re going to sit in regular coach, fly any cut-rate carrier for less money. Your seat and comfort will be no different.